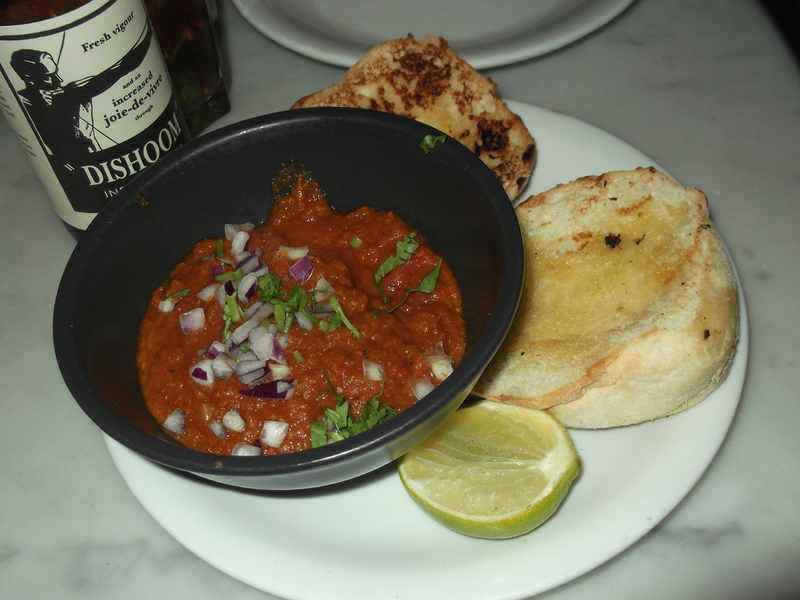 Dishoom is self-styled Bombay cafe, apparently an invention of the early 1900s by Persian immigrants to the UK, these cafes served up Indian food with a British twist. The Covent Garden branch has been open for over 2 years and they now have a second one in Shoreditch. 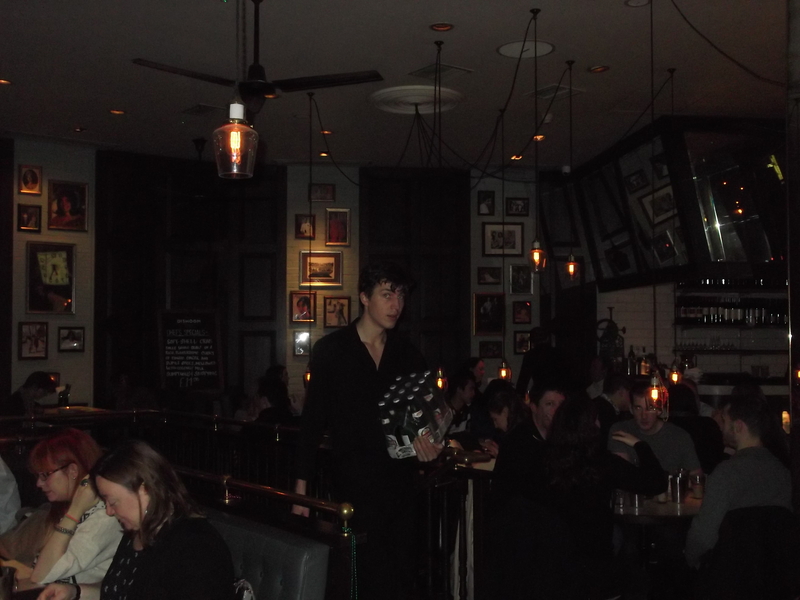 The restaurant is split over two floors and has a small downstairs bar – the tables upstairs are crammed together in the main part of the room, and there are booths along the walls, if there are 3 or 4 of you try and get a booth because they are a lot more spacious than the other tables. They don’t take telephone bookings so you need to go along on the night and reserve your table in person. When I went on a Saturday night there was a 45 minute wait for a 7pm table – unless you are keen on doing a spot of shopping at the nearby Seven Dials, I would recommend heading to the downstairs bar for a cocktail – they have a great range of gin cocktails (eg Bombay Pimm’s with saffron, mint, pomegranate and ginger beer £7.50). The menu is very long with 10 starter choices (£3.20 to £5.20), 9 grills (mostly meat, but also fish and paneer £5.50 to £11.50), and a few biryanis and bog standard curries (£6.90 to £9). Dishoom is an extremely noisy place, compounded by the open kitchen (although I enjoyed seeing chefs rolling out rotis and chapatis), it is certainly not a place for a romantic meal! The dishes are designed to be shared and to create a great mess – a task I managed with great ease. For starters we sidestepped the British Indian twists like the Bombay chip butty and chilli cheese on toast in favour of more traditional dishes: lamb samosas (£4.20), keema pau (minced lamb – £4.70) and pau bhaji (mashed vegetables – £3.90). The samosas were small, light and subtly spiced, with an intense lamb flavour that was lifted by hints of cloves and cinnamon – the lamb must have been minced that morning because the flavour was exceptionally fresh. The keema pau was equally pleasing, although it was slightly spicier than the samosas, masking some of the beautiful lamb flavour, and somewhat oddly, it was served with a grilled white bap buttered with ghee. The rolls were certainly freshly made because I saw a chef knocking them down at the front of the open kitchen. The Pau Bhaji (mashed vegetables) looked a bit like the kind of mushy vegetable slop that would be served in a hospital (although it was nicely spiced). 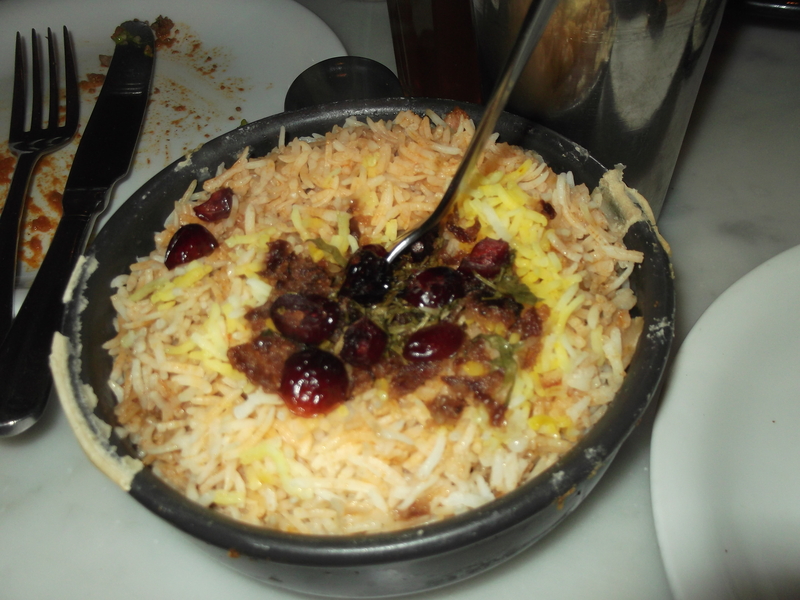 I sampled the chicken and lamb biryanis: the quality of the meat was good in both, the rice was not overcooked and the flavours balanced very well (especially the tart cranberries against the dry spices in the chicken). I also opted for the chicken “ruby” (£7.90) which had a coconut milk base lending a nice creamy finish although the sauce was rather thin. The okra fries £3.50 were fantastic and I insist that anyone that eats at Dishoom orders them. 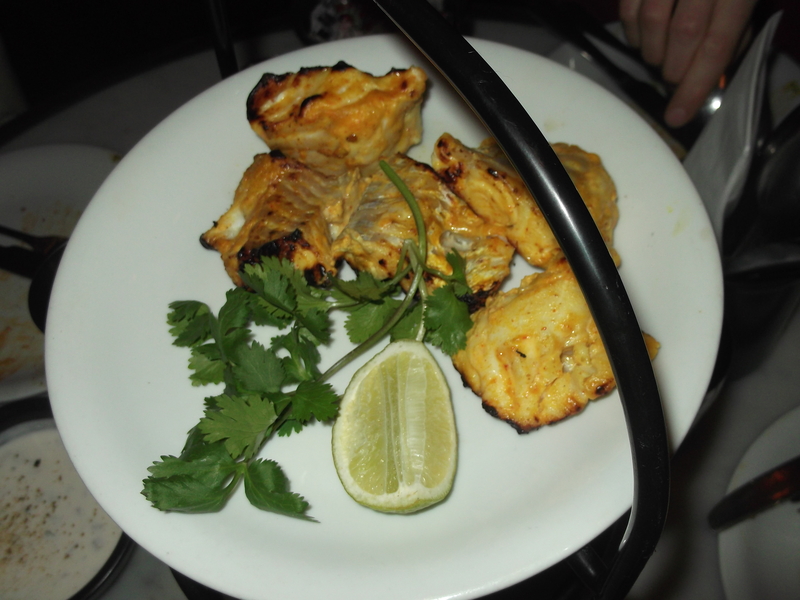 Dishoom offers great value Indian food with some interesting British twists, although I recommend renting some ear defenders before you visit because it is in the running to be the noisiest restaurant in London. Also see: edge and spoon and dotty dishes.